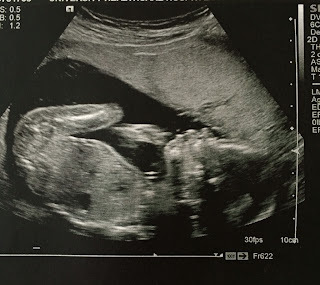 Thursday Thoughts - It's a Girl! 1. First and foremost, we're having a baby girl at the end of March! We're very excited for Amelia to have a younger sister. I feel blessed to have great sisters of my own and I hope my girls will love and treasure (and steal shoes from) each other the same way I do my sisters. I've been feeling sick but not nearly as bad as my first pregnancy. Though the morning sickness is clearing up, the number of posts will probably remain on the same minimal schedule it has been for the past few months as I spend my time preparing for the baby, getting sleep and putting my feet up as much as possible. And also buying more insanely cute baby girl clothes, because who can resist those little baby dresses? 2. My sweet husband bought me a new phone this week. This is big news for me because the last time I had a brand new phone was nine years ago. The company my husband interns at gave their employees a fairly hefty gift card for meeting a sales goal and my husband bought me a new phone with it. Isn't that so sweet? I've bought/taken used phones from family for the past few years and with abuse from a toddler some of the buttons on my old phone were breaking. My husband reasoned that most of our pictures and videos are shot from my phone, so it made sense for me to have the new phone. It was a very happy surprise. 3. The World Series is here! The Red Sox are undefeated in post-season games when Amelia wears her little cheerleader dress that day. Obviously there is a correlation. Looks like I'll be doing a lot of laundry in the next week! Have a great, happy week! OH MY GOODNESS!!! Congratulations, Nicole!!!! That's so so so exciting :) So glad your morning sickness hasn't been as bad this time around and that you've been able to keep up with some posting. I'm so happy for you guys!! Congrats, Nicole! Best wishes to you in your pregnancy -- that's so exciting that Amelia will have a sister. I'm pulling for the Red Sox because I do love Boston, and the Cardinals beat up on my Dodgers in the playoffs. Oh Congrats Nicole!! Hard to believe you looked so slim and trim at the wedding. :-) Yes it will be super fun for Amelia to have a sister!